Brazilians most certainly are among los latinos en Miami-Dade, and their impact is felt increasingly across the Miami urban region. It just so happens, though, that the US Census dataset used for creating the recent Miami Geographic map post on los latinos didn’t contain Brazilians as a “Latin/Hispanic” origin. A similar census dataset does exist, though, albeit with a slightly different set of variable definitions. I ended-up using the 2012 American Community Survey 5-yr estimate (the one least prone to estimation error), specifically the “Foreign Born” dataset. So, here it is. 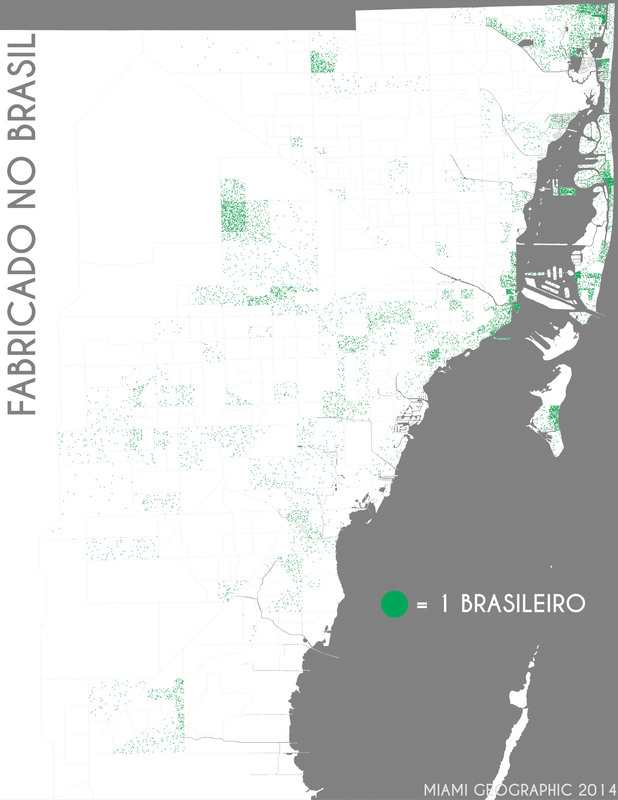 We’re looking at those Miami-Dade County residents who were ‘made’ (that is, born) in Brazil, or fabricado no Brasil. Fabricado no Brasil. Data Source: 2012 American Community Survey, 5-yr Estimate. Map Source: Matthew Toro. 2014. Again, South Americans in Miami-Dade seem to congregate primarily to downtown Miami, the northeast (Aventura and environs), and Doral. Brazilians seem particularly fond of Brickell key too. Let’s not forget Treasure Island, though; there’s a sizeable cluster of Brazilians there as well.